Springfield, MO. (March 15, 2016) – The Springfield Art Museum presents an artful weekend for all ages. Every March, we invite student artists from across our community, in kindergarten through twelfth grades, to exhibit outstanding artwork in the “All School Exhibition.” A celebration of Youth Art Month, this highly anticipated show has been a staple of our exhibition schedule for over forty years. As the art teachers who work with these students know, art is a powerful educational tool. In addition to creativity and self-expression, the arts teach problem solving, critical thinking, innovation, and collaboration. Artwork created by children and teenagers is often relegated to education wings or hallways when it is displayed in museums. By showcasing students' work in one of its primary gallery spaces, the Springfield Art Museum seeks to highlight the importance of arts education and honor the accomplishments of young artists. The exhibit also reflects the work of the incredibly talented teachers in our community, many of whom are practicing artists themselves. Faculty members from public, private and parochial schools select artwork for exhibition, and a dedicated team of teachers and students from Springfield Public Schools installs the art in the galleries. That installation work is currently underway and middle and high school student artists will enjoy an opening reception on Friday, March 18 from 5:30 -7:30 PM. The public is welcome to this free reception; however the exhibition officially opens on Saturday, March 19. On Sunday, March 20 it is the elementary student artists’ opportunity to be applauded at the elementary reception from 1 – 5 PM. This vibrant, colorful, expressive show will be on display until Sunday, May 8th. Admission to the museum is always free, so come out and support these young local artists at this annual favorite. 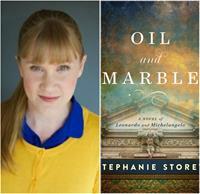 A veteran TV producer originally from Hot Springs, AR, “Oil and Marble” is Storey’s first novel. It has already sold out of its first printing; however copies are still available at the Springfield Barnes & Noble. Storey is represented by Skyhorse/Arcade Publishing. The book talk is free and open to the public. See the All School exhibition and listen to Stephanie Storey this weekend at the Springfield Art Museum, located at 1111 E. Brookside Drive. Admission is always free.